Various organisation carried out candle march demanding immediate arrest of culprit involved in Gohpur hit and run case. 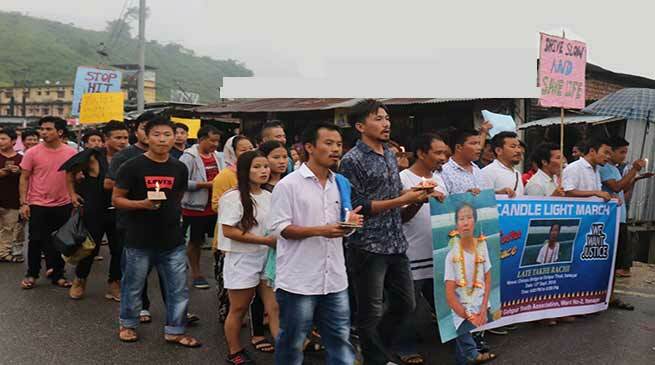 The All Gohpur Youth Association Ward No 2 (AGYA W-2), supported by several other organisations of the capital complex took out a candle light march, here on Thursday evening, and reiterated its demand of arresting the tempo driver involved in the hit and run case of one Takhe Rachi. It must be mention here that ” an unidentified tempo hit Rachi on 7th September at around 6.40 pm at Gohpur Tinali. While onlookers came to help her, the tempo reportedly fled from the scene. She was rushed to the hospital but was declared “brought dead”. Addressing reporters, AGYA president Sorang Talo said that they have submitted a memorandum to the Capital deputy commissioner, Capital superintendent of police and the local MLA demanded speedy investigation so that the culprit could be arrested at the earliest. Also claiming that many of tempo and trekker drivers consuming alcohol, do not have valid driving license, do not properly maintain their vehicles , and violating traffic rules. The association requested the district administration to carry out routine checking on all commercial vehicles and drivers for driving license, working lights and indicators, and the overall condition of the vehicle. They also sought CCTV installation at Gohpur Tinali for constant vigilance, permanent deployment of police force at Gohpur police and speed breaker at the tri junction (Zoo road-Chimpu road-Ganga road). A widow, Rachi is survived by her four children. Meanwhile Itanagar police sources said that a case has been registered at Itanagar police station vide Case No-253/18 u/s-279, 34 IPC. All formalities were conducted and body was disposed off properly. The capital police is investigating into the matter and trying its best effort to nab the culprit.